In 1986 Sugar Ray Dinke released one of Chicago's first homegrown hip-hop songs: "Cabrini Green Rap." The tune's hard-hitting house-influenced beat is a nice riff on the sound Run-D.M.C. rode to popularity—the electronic drums, big crunchy guitar samples, and all—though it doesn't quite evoke the grim reality of the housing projects that provided the name and lyrical inspiration for the track. Now, nearly three decades after Dinke dropped his song and just a couple years after the last Cabrini-Green high rise became a pile of rubble, 29-year-old Tremaine "Tree" Johnson is making inroads in the national hip-hop scene by digging up memories from his youth in one of this city's most infamous projects. 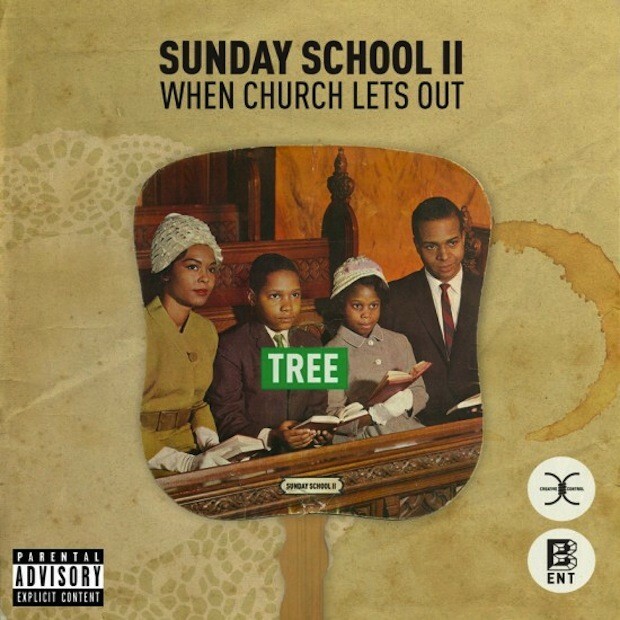 Cabrini-Green isn't the only thing Tree raps about on the brand-new Sunday School II: When Church Lets Out, but it's part and parcel of certain details that are hard to forget. The neighborhood has been a constant presence in Tree's music dating back to his official debut, 2010's The Third Floor, and he's a master of finding insightful new ways of discuss growing up "on the third floor / dirt poor." On Sunday School II he gives a shout-out to a childhood friend who graduated from Georgetown Medical School, talks about a lucky break he got after he was arrested while ditching school, and raps about the loved ones who kept him out of trouble. Tree told me about how his older siblings and cousins prevented him from getting involved in gang life and selling hard drugs when I interviewed him for a B Side feature that came out in August; although he was essentially barred from joining a gang Tree found a group of his own, and passed through what would otherwise be considered rival gang turf to make friends. Tree approaches hip-hop in a similar fashion—he's aware of the cliques around him and the way that others craft rap tracks, but he does whatever he wants to do anyway. It's helped make Tree one hell of a fascinating artist. Last year's Sunday School is great partially because of how natural it sounds. Tree made it on GarageBand, piling up simple synth melodies, lean 808 drums, and unstable and oddly cut soul samples into a woozy, endearing concoction that blends well with his grainy voice. Sunday School isn't mixed or mastered, which adds to the mixtape's raw and slightly dissonant sound. It's an odd effect that's a little punishing on the first encounter, but Tree has a way of making things that are aggressive and slightly off sound just right. Tree's sound has made for some great tracks and set him apart from the bulk of local and national rappers, but it's also part of what's made him hard to approach—some people just don't know what to make of him. In the wake of the drill scene's international surge in popularity that jumpstarted after Chief Keef dropped his Back From The Dead mixtape early last year, there's been a nagging insistence to define any up-and-coming Chicago rapper through the lens of the local apocalyptic spin on trap—Tree's sound doesn't exactly fit the mold. His age doesn't make things any easier; he's got nearly a decade on many of the local MCs that have inked massive deals, which caused Spin to label him an "elder statesman." His work is grounded in a sense of community—he rolls with Project Mayhem and released a mixtape of collaborations with other locals called Tree Featuring the City—but he doesn't quite have a crew that's synonymous with his brand like, say, Save Money. Tree is difficult to classify in 140 characters, which says a lot about his multidimensional work, but it's certainly tough to sell to the uninitiated. Fortunately things have aligned just right for Tree to reach new ears with Sunday School II. Part of it is circumstance; the recent release of Chance the Rapper's Acid Rap mixtape has shown outsiders that there are other parts of Chicago's rap scene outside of the drill sound. Tree himself has done a great job of boosting his own presence—after all, he's a savvy salesman who spent several years selling women's shows at Nordstrom—and he's found some success spreading his music under a tag he came up with called soul-trap. Tree earned national accolades for Sunday School last year, and the months leading up to Sunday School II were peppered with song releases that helped stoke interest in his work; he dropped tracks with acclaimed rappers Roc Marciano and Danny Brown, MTV premiered a Sunday School II video, and he landed in the lineup for this year's impressively stacked Pitchfork Music Festival. All that leads up to 2 PM today, the time that Tree is slotted to drop Sunday School II. It's a gargantuan mixtape, a 17-track collection that runs nearly an hour long and requires multiple listens in order to dig into Tree's heartfelt stories. Tree's production is as strange and charming as ever, though this time it's slightly cleaner; SoundScape Studio's owner and chief engineer Michael Kolar (who also co-runs Closed Sessions, which is releasing Sunday School II with Creative Control) mixed and mastered the mixtape, giving Tree's sound a nice polish that keeps the grit intact. The smooth sound is one of many changes that'll help Tree reel in new listeners, and while the contributions from Danny Brown and Roc Marciano will get people to tune in, it's Tree's remarkable spirit and personality that will get them to keep playing. The newest track from the the forthcoming Ahead Of My Time mixtape makes the MC's rise seem like a lock.